If you don’t want to tackle the traffic just to have your dog washed and you are in the Blacktown area or surrounds, for a great service call Jim’s Dog Wash today on 131 546 or request a free quote online to arrange for Steven to get in touch with you. Steven can help you with a simple Dog Wash, Coat Clipping (hair cut), cutting Nails or just a tidy up. Get in touch with Jim’s Dog Wash now to have Steven come and take care of your four legged friend today. Hi, I just like to say a big thank you to Steve Holovati from Blacktown, He did a fantastic job, My dog looks great feels great and is so much happier, Steve is so professional and I am so happy with the service I was provided today.. thanks you Steve from Jim’s dog wash.
At Jim’s Dog Wash, our Franchisees are passionate individuals that are genuinely concerned with caring for all dogs in their local community, proving to be highly professional, reliable, trustworthy and caring business owners. 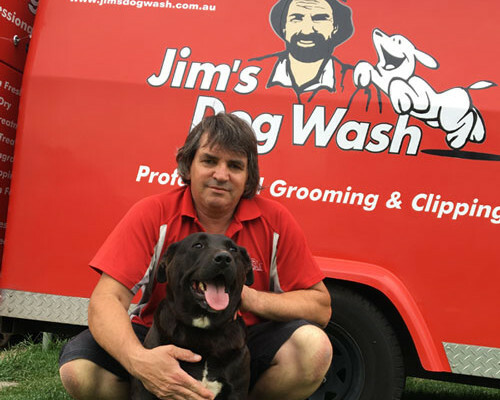 These individuals are carefully selected and well trained by some of Australia’s best dog grooming instructors and complemented with continuous support from Jim’s Group, Australia’s largest home Services group. Despite the expectations of a mobile grooming service being one of ‘Splash and Dash’, our service at Jim’s Dog Wash will never fail to provide a quality service with flexibility in order to cater for all our customers’ requirements in the 21st century where there is always so much to do.